← Is the Yakima-Ellensburg Commuter Illegal? Last night on Twitter, I posted a couple off-handed tweets noting how I had previously taken photos of a Sound Transit bus when it was still owned by them that is now owned by BFT, and I could do a before/after comparison with those photos now. In response to those tweets, a Twitter conversation between myself, @transitdude, @oranv, @danielmwarwick, and @safesler came to end up as a plethora of good ol’ “transit humour.” There’s was a lot of good material from the whole conversation, but I wanted to highlight some of those tweets below. 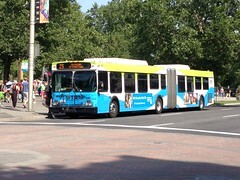 @ziggzagzac: Saw 2 more ex-[Sound Transit] coaches in service today. Found out that I have pics of one in its former life. That’ll be a fun before/after comparison. 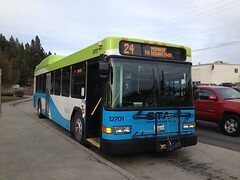 @ziggzagzac: I’m sure if I dig around [Seattle Transit Blog]’s Flickr pool, I’ll find pics of all the ex-ST coaches that BFT bought. It’s nice to use my own pics though. @transitdude: didn’t they get reprinted? @oranv: I once saw a Party Bus on the [Highway] 520 bridge and mistaken it for a Community Transit articulated bus. @ziggzagzac: Ain’t no party like a Snohomish County party ’cause a Snohomish County party don’t stop! 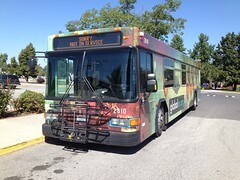 @ziggzagzac: Just mobilize the party and rock out on the [King County Metro Route] 358. How could that possibly go wrong? @safesler: And continue the fun to the [King County Metro Route] 150!!! Ballin’, yo! @ziggzagzac: No more #150problems cause it’s a #150party! Bonus, all the supplies are probably on the bus. @safesler: Boom box, cans, silly string (or what looks like it), ugly sweaters, entertainment…yep. @transitdude: sad. No Sunday party. @oranv: Disco Bus on a Saturday night is all you need. The thing about transit humour, as Oran pointed out, is that it is very localized. For example, a joke about the riders of KCM Route 358 probably makes very little, if any, sense to someone who lives in Cincinnati. Another example, a tongue-in-cheek remark about Toronto’s “Red Rocket” doesn’t mean much to a resident of Los Angeles. As users of transit, we’re more likely to be spending more time getting to our destinations, and are going to have to do that in close quarters with just about every member of society imaginable. For many riders, humour can be the only thing that keeps them going on a daily basis. If we can’t laugh at the “company” we’re sharing a ride with, why would we want to keep using transit? So readers, I’ll ask you… What is the funniest thing about your local transit agency? Is it a route, an agency nickname, a particular rider, or something else? Leave a comment below, or send me a tweet to @ziggzagzac.